If you don’t want a smart meter on your home, you won’t want V2V in cars. 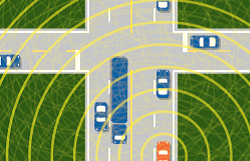 The National Highway Traffic Safety Administration (NHTSA) is proposing to mandate radar (called V2V technology) in all new cars and light trucks. The stated purpose of the V2V is to improve driving safety by warning drivers of imminent crash risks in time to avoid them and pave the way for self-driving cars. V2V is like a smart meter in your car! The antenna is omni-directional, allowed to transmit up to approximately 2 watts of power output at 10 Mhz and 5.9 Ghz with a range of 300 meters, or three football fields in length, every 100 milliseconds, or 10 pulses a second. The proximity of the transmitter to the driver and passengers is unknown, but could be inches to a few feet away from people in the car. We strongly oppose mandating V2V in cars and light trucks. All roadway corridors will have significant increases in RFR exposure from V2V and supporting infrastructure. V2V poses increased safety hazards to drivers, passengers, people in homes who live along roadways, cyclists, and pedestrians. Increased RFR exposure from V2V threatens nature, trees, birds, bees and other insects. Vulnerable populations such as children, seniors, people with electromagnetic hypersensitivity (EHS), and people with medical implants are at greater risk of harm. Assertions of RFR harm are based in peer reviewed published science. No scientific evidence establishes a causal link between wireless device use and cancer or other illnesses. There’s no scientific basis to link EHS symptoms to EMF exposure. The National Environmental Policy Act does not apply. V2V will not have a disproportionate effect on children. Consumer education by the Federal Government and vehicle manufacturers may help to alleviate RFR concerns. We believe V2V technology will not make driving safer, but will make driving more harmful to people and the environment, create mobility access barriers, and should be stopped. Posted on April 10, 2017 October 27, 2017 Author adminCategories Cars, children, EMF Sensitivity, Take Action!, V2V, wildlife, wirelessTags RF health impacts, Take Action2 Comments on Stop radar in cars! Dr. Sam Milham. author of “Dirty Electricity” talks with John Wells on Coast to Coast radio on August 17,2013. Another reason to avoid new cars! Many people who are EMF injured know that cars are problematic-and especially newer cars due to all the wireless installed. We’ve measured cars for electromagnetic fields (EMF’s) and found in newer cars there are EMFs from different sensors, including air conditioning and braking systems. The back seat of a Prius is a hot bed of batteries- not a safe place for a long drive! Recently, Forbes author, Andy Greenberg reports on a new auto hazard- the ability for hackers to attack your car, causing your brakes to fail, gauges to deceive you, horn to honk, and other serious hazards. See video below. Since these attacks are done using wireless signals, there’s also the possibility of random interference causing havock on newer cars. Also in 2010 an angry auto sales ex-employee in Austin Texas remotely shut down 100 cars by disabling them, setting off car alarms and forcing car owners to miss work, or have their cars towed. For people buying a car, find an older model prior to 1995, and use a Trifield (ex100) meter to measure for EMF’s. Click here: EMF Wise to learn more about testing cars for EMF. Posted on July 26, 2013 July 26, 2013 Author adminCategories Cars, EMF Sensitivity, wireless3 Comments on Another reason to avoid new cars!